Is coffee fattening? Will that morning joe or lovely latte tighten our pants, split our seems or burst our buttons? That’s a great question since coffee makes up a big part of the typical day. That really depends what we put in it. Certainly a latte can be fattening, or coffee with nine sugars and whipped cream on top. Rejoice though because coffee itself is far from fattening. In fact a cup of coffee packs a grand total of one calorie. Better still, coffee can help a weight loss diet. Caffeine revs up the metabolism and that means it torches calories. More calories burned means… well, you get the idea. Tragically, dieters tend to toss a monkey in the weight-loss gears by adding sugar, creamer and other fattening fillers to their morning Joe. Read on to see how innocent coffee can turn into a pound-pushing monster. Is Coffee With Creamer Fattening? While coffee isn’t fattening, that doesn’t mean we can’t make it fattening. Tossing a birthday cake on top of a watercress salad doesn’t make you Richard Simmons. Just so, cramming cream and sugar into coffee won’t help your waistline any. So if the question is, “Is coffee fattening” then the answer’s no. Coffee with creamer, coffee with milk and coffee with a ton of added sugar though will pack the pounds on faster than a bucket loader. Need a break from coffee anyway? See our complete guide to the best coffee alternatives on the planet. An offshoot of the fattening coffee question, lattes do ramp up the calorie count. That’s because lattes often dump in milk, sugar and flavored syrups. If we could take a centrifuge and separate out just the coffee from the latte, the result would be a low calorie (if flavorless) diet beverage. That said, the average latte has about 150 calories. That’s because they use foamed milk for a creamy taste without a creamy fat-load. Cutting out the sugar can make a latte even more diet-friendly. Is Coffee Bad for You On a Diet? Coffee isn’t a terrible diet food. The caffeine in coffee can spin up the metabolism to high fat-burning levels. One downside is, diets themselves aren’t the greatest idea. Short-term dieting makes us hungry and lowers our energy reserves. In the long term, healthy eating habits like choosing fresh veggies and lean protein beat diets any day. That’s true whether we drink coffee or now. To see just how fattening coffee can be, check out the Pinterest shares of calorie-crammed coffee recipes below. The fattening coffee recipe above mixes two cups almond milk, a chocolate bar, whipped cream, chocolate syrup and sugar to make one of the least diet-friendly coffees ever. The estimated calorie count of this mocha monster runs in the 1,500 range. Disappointed there’s no actual coffee in this beast? The chocolate bar lends it a caffeine kick and you could always add a 1-calorie coffee to it if you wanted. There’s nothing quite like starting your day kicking yourself for blowing out your diet. The coffee smoothie above blends coffee, ice, yogurt (note: yogurt is healthy), chocolate chips and chocolate syrup. Calorie estimate: 750. Wait a second, that doesn’t look like Greek Yogurt on top. It looks suspiciously like whipped cream. Apparently they felt the need to make the drink seem healthy somehow. As long as we’re skewering our diet, why not hop off the wagon while we’re at it? 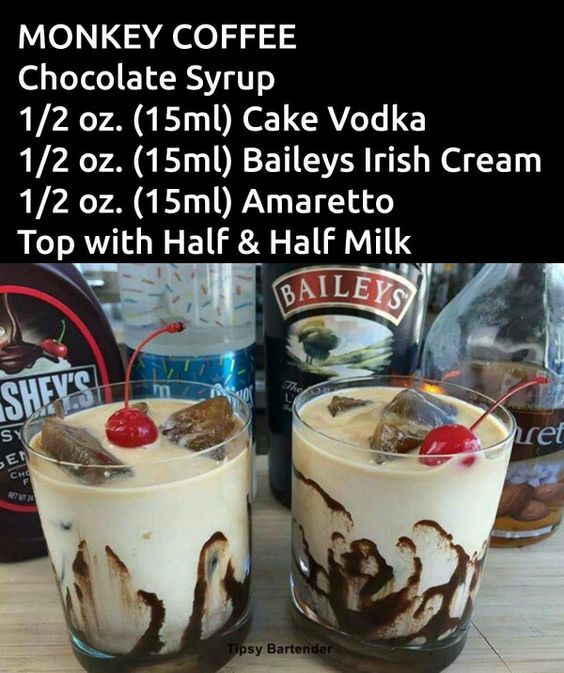 “Monkey Coffee” mixes chocolate syrup, “cake vodka,” Baileys, Amaretto, cream and milk. We don’t know what “cake vodka” is but we need about three bottles of it. Instantly. The calorie estimate for this diet and 12-step-program destroyer? 1,000. Make that 1,100 if you add the maraschino cherry.